We are a reliable and licensed man and van company that provides a range of affordable and comprehensive moving services to clients in Kentish Town, NW5 and the surrounding area. If you are looking for professionals with a vast experience in the business, you have come to the right place. We have everything it takes to provide a stress-free and smooth removal experience to both commercial and residential clients. House and office removals can be stressful, so that’s why we listen to our customers and what they need in order to meet their needs and make the entire moving process less complicated and stressful thanks to having the right Kentish Town man and van by your side. Our goal is to meet and exceed your expectations and our team of movers work hard to achieve that. We have a fleet of fully equipped removal vans for extra safely of your belongings. We have vehicles of different sizes, including small vans, cargo vans, Luton, transit vans and 7.5. Therefore, if you are looking for a professional service that will treat you and your belongings with utmost care, hire us for your upcoming NW5 removal or other service. We provide clean and safe storage facilities for our clients. Whether you need permanent or temporary storage solution, we are here to meet your needs. We have well maintained, clean and safe warehouses that have a guard and CCTV security system. So whether you need to store your furniture, few office boxes or other, you can completely to rely on us to keep your goods safe and undamaged. Whether you are moving across the street or other parts of the country, rest assured you will receive the best service at affordable rate for our man and van Kentish Town solution. Our polite and hardworking staff will make sure everything goes smoothly. Contact us today and get your free quote. If you don’t want to use our effective full house removal service in NW5, consider hiring competent helpers from us. They can give you a hand for the removal of a large sofa, for example. Whatever tasks you assign to them, our skilled helper crew in NW5 Kentish Town will execute them with great precision and meticulousness. We can send one, two or more seasoned helpers at your home depending on the scale of your relocation. Kentish Town is the part of the London Borough of Camden. The area is known for numerous shops, which a majority of them are independently owned. Kentish Town Road is a mixture of retail chains, bookshops, independent shops, organic stores and other. The most popular bar in Kentish Town is Pub Rock, and Bull and Gate follow. For history lovers, there is the St Pancras public baths, built in 1903. It is the largest municipal building in city. 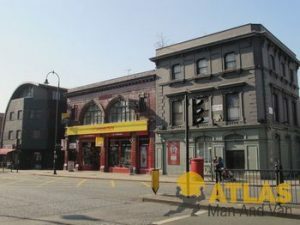 Kentish Town has excellent public transport links and people who live in NW5 have easy access to local and nearby stations, among which is also Kentish Town tube station. Thanks to that, the area is widely popular among professionals who work in the City. Similar to many other districts in this part of London, most of the homes in Kentish Town are Victorian terraces. The old warehouses in NW5 have now been transformed into flats.